This week is the final glorious sunset of Heart of the Swarm with the WCS Global Finals 2015 concluding this weekend, and most players have already moved to Legacy of the Void. The transition maybe quite unsettling for many, and here is my way to ease it. Some questions have no answer, but there are two rather more specific questions that can be answered. What are the new unit compositions? What are the new build orders? Our knowledge in Heart of the Swarm can actually be carried over better than we may assume. The opinion on how closely related the two games are is quite divided, as some even call it a new game. The basic interactions of the game do not change, so it is fair to argue that we can apply the knowledge in pre-LotV to LotV. A related question is whether mech is the new dominant composition. As it stands now, it seems that Blizzard have been trying to make mech work for a long time, but they have no intention to make bio redundant. I actually think that the balance of mech and bio is pretty good in HotS right now. Anyway, more specifically to the first question, I believe that the core compositions should still remain the same. In terms of composition, the only thing that can change is the “side deck” units. I will use TvZ as an example. In WoL, it is Marine, Tank, Medivac and Marauder for bio. The core is essentially Marine and Medivac plus aoe, and Marauder is a counter unit. In HotS, the fundamental idea of the core is still the same, Marine and Medivac plus aoe. However, HotS provides more aoe choice, as we have Hellbat and Widow Mine added. After a while, the players figured out that Widow Mine works best, and Marauder is given a more important role than just a counter unit since there is no sustain support from Tank. As you can see, the core composition remains very similar. This is largely due to the fact that there should be a set of core units that compliment each other the best in terms of resources and roles, and this logic applies to the other two races as well. This is already showing in the current LotV metagame, for example, Liberator has replaced Thor in TvZ for the anti-air role to support 4M, and they probably gives better ground support too. This will only change if there is another unit that does more or less the same thing as another core unit, but better. A close example is Adept and Zealot, and I hope this will get resolved in an elegant manner. Therefore, all in all, you can basically play the same unit composition that you’re comfortable with and mix in different new units to play test. What are the build orders? I am sure you have read some build orders posted on various forums, and you probably have tried them out. The important take away from the build orders posted so far is that the building blocks concept is still relevant. Here are examples of TvP and TvZ. 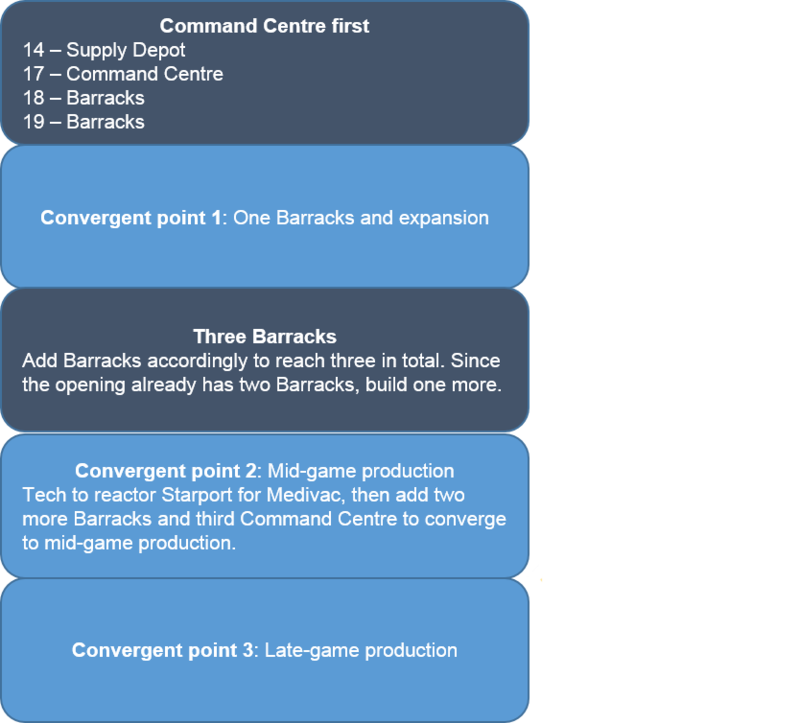 The TvP example is basically a Command Centre first into three Barracks standard build, and this is quite popular in WoL and HotS. It is not exactly different compared to what Terran is doing now (see the image below). You have an opening that moves towards the conventional convergent point of having a Barracks and an expansion. Then, you choose your path to reach the midgame convergent point. In the above example, it looks something like this. Click to enlarge. The rest of the build order is something specific to LotV, as it emphasizes on Liberators with more Starports. I am not going to comment on that, because only time will tell how the match up will play out in terms of composition and game plan. The TvZ example also fits well with the current HotS understanding of the match up. It is a single Reaper expand into 1-1-1 with a Hellbat timing, and it looks like something like a build like this in HotS (vod below). Instead of getting a Medivac, the LotV build uses a Liberator. There are certain things that are fixed in WoL and HotS no matter what opening variation you do. The first Supply Depot is always built at 10 supply unless you do an extreme cheese. 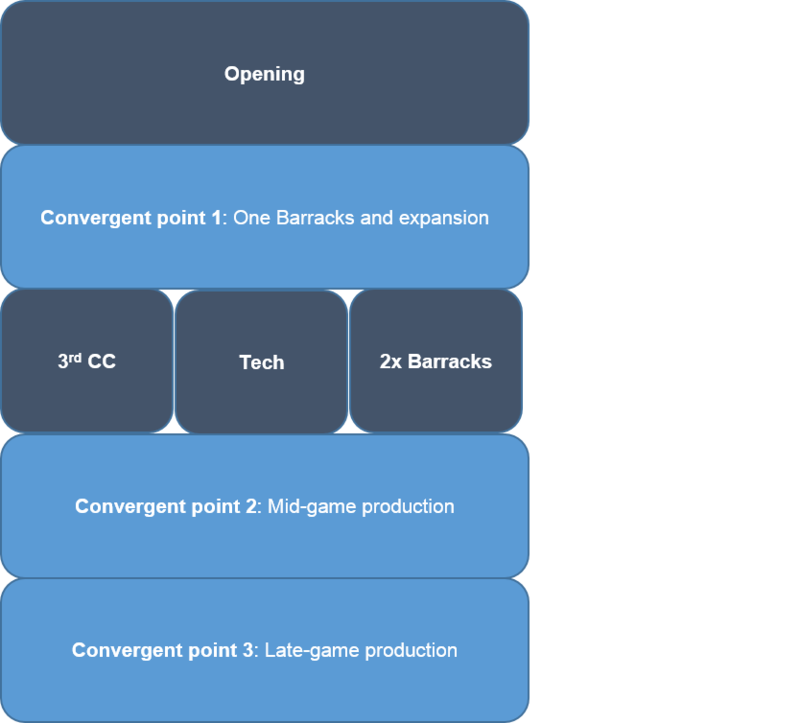 If you go for a Barracks first, it is usually at 12, unless you want to delay the Scv production for earlier Reaper or Marine production. The Command Centre first opening will put down the Command Centre at 14 or 15 supply. The number will definitely change in LotV because of the increase in starting worker count, but they will also be fixed in the same manner. Based on the build orders above, the new numbers are as followed. First Supply Depot is built at 14. If you go for Barracks first build, it will be down at 16 Supply (queue Scv) right after the Supply Depot is done. In HotS, the timing of the first Refinery (right after Barracks) defines the build you do, and it can be 12, 13, 14, 15 or even 16. For Reaper opening, it is always the same as the Barracks, and that is usually 12. This is to line up the amount of gas you mined and the building time of the Barracks to ensure you have 50 gas when the Barracks completes. This does not change in LotV, and hence, the Refinery timing is at 16 as well for Reaper opening. As time goes by, more builds will be developed with different refinery timing. I expect the second refinery to be taken earlier, because of the mineral-gas ratio in LotV. As for Command Centre first, it is at 17 for LotV. I am sure the gas first builds will have a fixed timing too, and it should be at 14 or 15. Once you have figured out the standard set of numbers of the key core openings, you basically just apply the building blocks concept to try builds out. Subsequently, you will refine it accordingly, so you shouldn’t have to relearn LotV again. I have not played a single LotV game yet, but I can apply my knowledge and understanding from HotS in the following manner. Say, I want to do a Reaper expand into three Barracks, which is pretty common in TvP. It should look something like this. Put down two more Barracks when you have mineral. I simply pick the single Reaper expand opening, and follow it up with three Barracks build order. Like I have said, I have not played a single game yet, and I will need to refine the build to test the basic build sequence. I am not sure if I need to take Scvs off gas like how it is in HotS, and if I do, may be I will put them back really quickly. This is because the relatively high number of workers mining mineral may require some minor adjustments to ensure the build order flows well. Probably many of you have already figured this out and copied some builds. The point I want to get across is that, the HotS knowledge and building blocks concept ease the transition. Furthermore, other build order variations should be applicable too. For example, the Reaper expand into three Barracks build above, you can go for an early timing instead of teching straight up. It is important not to mix up these two build orders as they have very different implications. Whether they are equally feasible in LotV is a different question altogether, as no one is certain how the game will shape up. In sum, if you have a good understanding of the building block concepts, it definitely helps immensely in the transition. If you have been one of those who remember build order by heart, it is time to read the following articles on the important concepts. Nice, thanks. I have no idea about the current builds.